If you've been thinking about purchasing a Universal Audio Apollo Rack or Apollo Twin, now is the time to buy! Don't Miss out on Universal Audio's year-end deals! Buy and register anyApollo rackmount interface (Apollo 8, Apollo 8p, Apollo 16, or Apollo FireWire) through December 31st, 2017, and you’ll get a UAD-2 Satellite OCTO or QUAD DSP Accelerator — up to a $999 value — absolutely free! Don’t miss this special end-of-year opportunity to get a supercharged Apollo rack system. 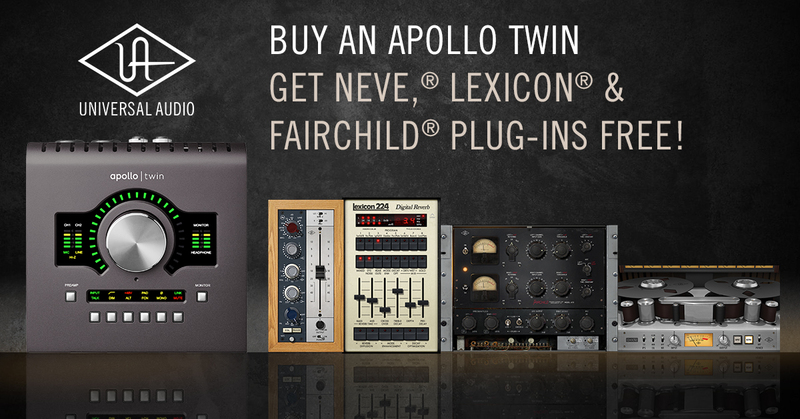 Buy an Apollo Twin - Gete Neve, Lexicon, & Fairchild Plug-ins Free! Now through December, purchase and register any new Apollo Twin MkII or USB audio interface and you’ll be able to add the classic sounds you hear on hit records with exclusive UAD plug-ins from Neve, Fairchild, Lexicon, and UA — absolutely FREE!